Whitnash Town claimed their second trophy of their season on Saturday with a 2-0 win over Wrens Nest in the final of the Birmingham Vase. 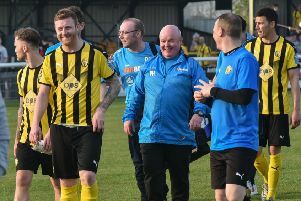 However, with the another cup final to come and Town handily placed in the Coventry Alliance Premier, manager Barry Shearsby is hungry for more. “Tony Clarke and I are very proud of the team and if the season ended today it’s still a great achievement to net two trophies,” said Shearsby. Whitnash were indebted to keeper Neil Stacey who guessed the right way to tip a 68th-minute penalty around the post with the game still goalless. Buoyed by their reprieve, Whitnash then looked the likelier winners but they had to wait until the 87th minute to break the deadlock, Ross Briscoe latching on to Lewis Currell’s pass and lobbing the keeper. With Wrens Nest chasing an equaliser, Briscoe made the trophy safe, running on to Ryan Billington’s clearance and volleying into the far right-hand corner of the net from 30 yards. Town followed up in style with an 8-0 win at Jaguar Daimler in the Coventry Alliance on Tuesday evening. The visitors dominated, with Luke Cole bagging four, Craig Watkin two and Henry Leaver and Jamie Coleman completing the scoring.